1. We don’t have enough equipment to clear snow and lay down salt on the roads. But snow- and ice-storms are rare down here, so that makes economic sense, even if it’s sometimes maddening. 2. Schools weren’t closed ahead of time for the day (though usually, this is done at the hint of a snowflake, tiny patch of ice, or even just very cold weather). When classes were finally canceled, parents (and buses) got on the road. 3. Everybody panicked, and left work at the same time to go home. Normally, I would have been at home writing, able to watch the snow fall outside my window. But that morning, I was in a town twenty miles away, signing copies of my novel, UNDERWATER. At noon, I headed home as flurries began, [luckily] stopping for gas first. I didn’t panic, but I drove cautiously as the flurries turned into flakes, the roads became treacherous, and more and more cars appeared. I wound my way using surface streets I know well, instead of highways often congested in the best of conditions. De toute façon, I did pretty well until I was 3 miles from la maison. 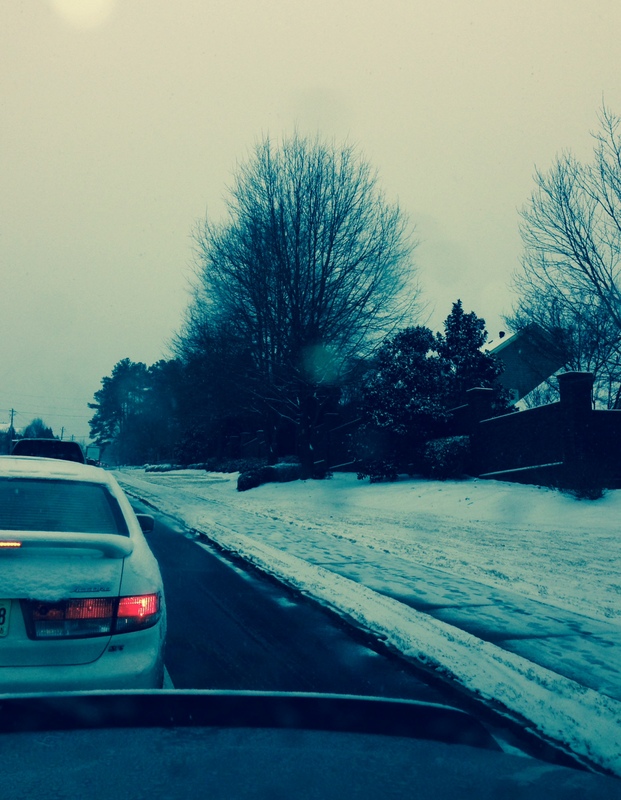 The streets weren’t yet icy, and though traffic was becoming heavy, cars were moving. Then I got caught in a bottleneck of vehicles at a light, almost all of us turning right. After a frustrating period (I don’t know how long), I ducked into a neighborhood and came out of it a mile further along my journey. Then, I came to a fork in the road, and had a decision to make. Both routes were equidistant from home, and both were hilly. My usual choice was the road on the left. I could see nothing but stationary red taillights on the right. I saw some on the left, too, but my iPad’s traffic app assured me that it was only for a short distance. So I took that road. It looked like the road less traveled by. At a certain point, I considered abandoning my car and walking. But that point was after I’d passed all side streets into which I could have turned to park. There was nowhere to ditch my car now (other than a real ditch), and I didn’t want to walk uphill in the cold, carrying my heavy bags. Inside the car was warm. I was making progress toward home at a turtle’s pace, but I was still making progress. And it wasn’t dark – yet – though it was getting colder. My husband, who had taken the train home from his office hours earlier, kept checking on me. I knew he was considering walking over to rescue me, but what could he do? What I needed was for him to somehow remove the cars in front of me – or at least, get the one right in front of me to move forward. But where could that car go? Nowhere, because the one ahead of him was barely moving. But that was better than nothing, and as I approached the turnoff for my neighborhood, I braced myself for its snow-caked and potentially icy streets. Without sliding, I made it up and down the steep hills and arrived at my destination just before six p.m. I was grateful to be home, even though I’d taken a road well heavily traveled. * Indeed, my iPad app (incorrectly) showed that it would. Didn’t notice the strike-through at first, and I thought, “well heavily travelled”, what a unique combination of words. Wish I’d said that.